TLJ Daily E-Mail Alert No. 733, September 5, 2003. September 5, 2003, 9:00 AM ET, Alert No. 733. 9/4. The Senate Appropriations Committee met to mark up several appropriations bills for fiscal year 2004, including the Commerce, Justice, State, and the Judiciary (CJS) appropriations bill. This bill includes appropriations for most of the technology related agencies, including the Federal Communications Commission (FCC), Federal Trade Commission (FTC), U.S. Trade Representative (USTR), Department of Justice (DOJ), U.S. Patent and Trademark Office (USPTO), National Telecommunications and Information Administration (NTIA), National Institute of Standards and Technology (NIST), and other Department of Commerce entities. The Committee released a short summary of the dollar amounts contained in the bill. This release states that the bill provides $6.3 Billion for the DOC, including $85.5 Million for the NTIA, $835.2 Million for the NIST, and $1.2 Billion for the USPTO. The bill includes $189 Million for the FTC, $277.8 Million for the FCC, $841.5 for the SEC, and $18.6 Billion for the DOJ and related agencies. However, most of the debate and discussion by the Committee at the meeting pertained to several amendments to the bill that legislate substantive provisions with appropriations clauses. First, the Committee approved a manager's amendment that includes a provision that prohibits the use of funds to grant licenses for a commercial TV broadcast station if the granting of that license would result in such party having an aggregate national audience reach exceeding 35%. This has the effect, during fiscal year 2004, of reversing the FCC's recently announced change to the national TV ownership cap. See, related story, below, titled "Senate Appropriations Bill Prevents FCC From Implementing New National TV Ownwership Rule". Second, the Committee approved an amendment that, in effect, provides that Northpoint will not have to obtain its spectrum at auction. See, related story, below, titled "Senate Appropriations Bill Includes Northpoint Spectrum Amendment". Third, the Committee approved an amendment that prohibits the USTR, during fiscal year 2004, from negotiating immigration provisions in free trade agreements. See, related story, below, titled "Senate Appropriations Bill Limits Negotiating Authority of USTR". 9/4. The Senate Appropriation Committee approved the appropriations bill for fiscal year 2004 for the Departments of Commerce, Justice, and State, for the the federal judiciary, and for related agencies, at a mark up meeting on September 4, by unanimous roll call vote. The Committee approved a lengthy manager's amendment offered by Sen. Judd Gregg (R-NH), the Chairman of the CJS Subcommittee, and supported by Sen. Ernest Hollings (D-SC), the ranking Democrat on the Subcommittee, that includes language identical to the House CJS appropriations bill regarding the national TV ownership cap. That is, it prohibits the use of funds to grant licenses for a commercial TV broadcast station if the granting of that license would result in such party having an aggregate national audience reach exceeding 35%. This section has the effect of preventing the Federal Communications Commission (FCC) from fully implementing, during FY 2004, the national TV ownership provisions of its June 2, 2003 Report and Order and Notice of Proposed Rulemaking [257 pages in PDF] amending its media ownership rules. See, story titled "FCC Announces Revisions to Media Ownership Rules" in TLJ Daily E-Mail Alert No. 672, June 3, 2003. On July 23, 2003, the House passed HR 2799, the "Departments of Commerce, Justice, and State, the Judiciary, and Related Agencies Appropriations Act for Fiscal Year 2004", by a vote of 400-21. See, Roll Call No. 422. See, story titled "House Passes CJS Bill With Media Ownership Section" TLJ Daily E-Mail Alert No. 705, July 28, 2003. Sen. Byron Dorgan (D-ND) offered no further amendments at this meeting. However, he announced that he intends to offer an amendment regarding the newspaper broadcast cross ownership provisions of the FCC's new media ownership rules when the full Senate considers the CJS appropriations bill. Sen. Dorgan (at left) stated that "I was intending to offer an amendment to that that would repeal the provision that the FCC has developed allowing cross ownership between newspapers and broadcast properties. I will not offer that amendment to the provision that Mary has packaged now. I will rather do that on the floor of the Senate." He continued that "it is very likely that before this bill gets to the floor of the Senate, before we deal with this on the floor of the Senate, we will have under expedited procedures, the Congressional Review Act, and a vote on a resolution of disapproval of the entire FCC rule. My expectation is that that will happen very shortly. There are 35 signatures having been filed at the desk, and the resolution of disapproval is now on the calendar. I have been talking to Sen. Frist and Sen. Daschle about that. So, I will not offer the amendment on cross-ownership today, but we will have that as an amendment on the floor, as well, when this appropriations bill comes to the floor." Sen. Ted Stevens (R-AK) (at right), the Chairman of the Committee, stated that "with the Circuit Court decision, that decision has the effect of your amendment. I am pleased that you will not offer it here. I want to tell you that I intend to oppose that amendment on the floor, because I believe that the Circuit Court's opinion sort of puts a whole new aspect to this." On September 3, the U.S. Court of Appeals (3rdCir) issued an order [3 page PDF scan] in Prometheus Radio Project v. FCC, staying the Federal Communications Commission's (FCC) new media ownership rules, pending resolution of the proceeding. See, story titled "3rd Circuit Stays FCC's Media Ownership Rule Changes" in TLJ Daily E-Mail Alert No. 732, September 4, 2003. Sen. Stevens added that "we are going forward on the cap provision, and that is in the House bill, that will take this FCC provision, really, out of conference, unless another amendment is adopted." "We don't need to be involved in a moratorium, or any decision concerning cross-ownership", said Sen. Stevens. Sen. Sam Brownback (R-KS) announced his opposition to the section CJS appropriation bill regarding the national TV ownership cap. Sen. John McCain (R-AZ), the Chairman of the Senate Commerce Committee, which has jurisdiction over the FCC and regulation of broadcast media, released a statement after the meeting. He said that "I am greatly dismayed that the Senate Appropriations Committee has chosen to usurp the jurisdiction of the Senate Commerce Committee today by including authorizing language on its Commerce, Justice, State Appropriations bill. I have never supported the use of the appropriations process to legislate policy, and it is especially disappointing to see this misuse of the appropriations process when the Commerce Committee has sent a bill to the floor that would address the precise issue added to today's appropriations bill." "With respect to the substance of today's action, I continue to be mystified by the inconsistency of separating the national television broadcast ownership cap from the local broadcast limits in legislation -- an action that seems only to serve the members of the National Association of Broadcasters", said Sen. McCain. Sen. Dianne Feinstein (D-CA) spoke with reporters after the meeting. She said that "Most of us just sort of arrived at the fact that 35% is a fairer number. The cap issue was sort of an easy issue. The other issue, on the cross ownership, is a much more difficult issue. ... It depends on whether you have large media markets, or small media markets." She added, regarding cross ownership, "It is really not the jurisdiction of this Committee". 9/4. The Senate Appropriation Committee approved the appropriations bill for fiscal year 2004 for the Departments of Commerce, Justice, and State, for the the federal judiciary, and for related agencies, at a mark up meeting on September 4, by unanimous roll call vote. The Committee also approved by voice vote an amendment offered by Sen. Mary Landrieu (D-LA) and Sen. Kay Hutchison (R-TX) pertaining to fixed terrestrial services in the 12.2-12.7 GHz band, that would enable Northpoint to obtain spectrum without going to auction. Previously, on June 26, 2003, the Senate Commerce Committee amended and approved HR 1320, the Commercial Spectrum Enhancement Act, with an amendment pertaining to Northpoint. See, story titled "Senate Commerce Committee Approves Commercial Spectrum Enhancement Act" in TLJ Daily E-Mail Alert No. 689, June 27, 2003. Specifically, the June 26 amendment, which was offered by Sen. John Sununu (R-NH) and Sen. Maria Cantwell (D-WA), provides that "Section 647 of the ORBIT Act (47 U.S.C. 765f) is amended (1) by striking ``global satellite communications services.�� and inserting ``global satellite communications services or for the provision of fixed terrestrial services in the 12.2-12.7 GHz band.��; and (2) by adding at the end the following: ``No license for fixed terrestrial services in the 12.2-12.7 GHz band may be used for the provision of mobile terrestrial telephony services.��." That is, it amends the ORBIT Act to exempt from auction spectrum fixed terrestrial services in the 12.2-12.7 GHz band. The House passed its version of the bill on June 11 by a vote of 408-10, without the Northpoint language. See, Roll Call No. 260. NorthPoint describes its technology as follows: "Northpoint is a patented, digital, wireless, cell based, terrestrial transmission technology that reuses radio frequency spectrum previously reserved for satellite systems. Northpoint can reuse this spectrum by keeping the terrestrial signal below the level to cause interference to the satellite signal, but above the level required to provide reliable terrestrial service. This is accomplished through several means, one of which is directional transmission. The Northpoint system consists of directional broadcast antennas located on towers, poles, buildings or mountains. The transmissions are oriented in a limited azimuth range, based upon the look angles to the satellite systems with which the Northpoint system will share frequencies, allowing harmonious simultaneous co-channel transmissions between satellite and terrestrial services." See, NorthPoint paper [9 pages in PDF]. See also, story titled "FCC Acts on Northpoint Application" in TLJ Daily E-Mail Alert No. 417, April 24, 2003. Sen. Landrieu (at right) stated that her amendment "has to do with with leveling the playing field between the technologies that are in the video and broadband service sector. Mr. Chairman, many of the members are familiar with this issue. The Commerce Committee has considered it, held a hearing on it, considered it, and approved what I am asking for our Committee to add to the underlying bill. It is, in my opinion, a free enterprise amendment. It is a pro-consumer amendment. It levels the playing field between the between cable, satellite, and the MVDDS, which is the multi-channel video distribution and data service new technology." "It will do many things. Importantly, it will reach rural areas. Mr. Chairman, you have been supportive of this because Alaska is one of those areas that is very difficult to reach through the standard technologies. It will improve our emergency alert systems. It will provide amber alerts", said Sen. Landrieu. She concluded that "I generally support auctions, and would not normally support something without an auction process. But, because we exempted satellite technology from auctions three years ago, we should either require all applicants for a particular spectrum band to go to auction, or none at all. So, this amendment levels the playing field, clarifies it, is in line with what the Commerce Committee did." Sen. Conrad Burns (R-MT), Sen. Ted Stevens (R-AK), and Sen. Kay Hutchison (R-TX) also spoke in favor of the amendment. Sen. Hollings spoke in opposition to the amendment. He stated that it replaces auctions with Congressional allocation of spectrum, and sets a precedent for not holding spectrum auctions. Sen. Feinstein also opposed the amendment. Sen. Dianne Feinstein (D-CA) spoke with reporters after the hearing. She said that "this is a public resource. If people are going to use it, they have got to pay something for it. And, you know, these companies are not in there for non-profit. I mean, they make huge profits." Northpoint issued a release after the meeting in which it stated that the amendment "will pave the way for rapid deployment of a new wireless communications service called MVDDS." It added that the CJS language "is identical to the Sununu-Cantwell Amendment to H.R. 1320, which the Senate Commerce Committee adopted on June 26." 9/4. The Senate Appropriation Committee approved the appropriations bill for fiscal year 2004 for the Departments of Commerce, Justice, and State, for the the federal judiciary, and for related agencies, at a mark up meeting on September 4, by unanimous roll call vote. It also approved an amendment offered by Sen. Dianne Feinstein (D-CA), Sen. Larry Craig (R-ID) and Sen. Byron Dorgan (D-ND) that would prevent the U.S. Trade Representative (USTR) from spending any appropriated funds for negotiating immigration provisions. Sen. Feinstein (at right) stated that "this amendment would prohibit the Office of the USTR from using '04 appropriations funds to negotiate or enter into trade agreements containing immigration provisions, or to otherwise amend immigration laws". 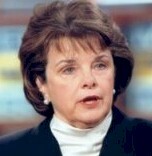 Sen. Feinstein is a member of the Senate Judiciary Committee, which has jurisdiction over immigration law. She stated that the recently negotiated free trade agreements with Chile and Singapore include immigration programs, "despite the fact that many members had appealed to the USTR not to do so". She said that this is "legislating an immigration program on a trade agreement". Sen. Craig also spoke in favor of the amendment. He said that "we need to send a very loud message to our USTR". Sen. Ernest Hollings (D-SC) added "this crowd is way off base." Sen. Robert Byrd (D-WV) spoke in opposition to the entire notion of trade promotion authority. Sen. Judd Gregg (R-NH), the Chairman of the CJS subcommittee, spoke in opposition to the amendment. Nevertheless, it was adopted, without a roll call vote. 9/4. The House Judiciary Committee's Subcommittee on Courts, the Internet, and Intellectual Property held an oversight hearing titled "Internet Domain Name Fraud -- the U.S. Government's Role in Ensuring Public Access to Accurate Whois Data". Benjamin Edelman, of the Berkman Center at Harvard Law School, stated in his prepared testimony [26 pages in PDF] that the way the domain name system is structured, "registrants are under only an honor system to provide accurate Whois data. Meanwhile, it makes no economic sense for registrars to enforce Whois accuracy. The result is that in terms of accuracy, when compared with other compilations of public data (such as driver's licenses and trademark registrations), the Whois database is substantially fiction." James Farnan, Deputy Assistant Director of the FBI's Cyber Division, stated in his prepared testimony that the Cyber Division regularly used the Whois database in investigations of cyber crimes. He stated "Sometimes the publicly available identifying information in the Whois database is inaccurate but the non-public payment information used to purchase the domain name is valid and legitimate. In those instances, serving a subpoena on the registrar can yield the real identity of the domain owner. Unfortunately, not every domain name registrar authenticates credit card or other payment information at the time the domain name is registered. Therefore, a suspect using a stolen credit card may be able to purchase a domain name with fictitious identifying information which is never checked or verified." Farnan added that "Whois data is inaccurate, incomplete, outdated, or deliberately falsified. If the Whois data leads to a dead-end, the FBI has other tools at its disposal to obtain information concerning the identity of domain owners." Theodore Kassinger, General Counsel of the Department of Commerce, stated in his prepared testimony that "The Department has long been concerned about the protection of intellectual property rights on the Internet. In order for the Internet to remain a secure and stable network for electronic commerce, businesses must have confidence that their intellectual property can be protected in the online environment. The Department�s �White Paper� called for, among other mechanisms, a searchable database of registered domain names that provide information necessary to contact a domain name registrant when a conflict arises between a trademark holder and a domain name holder. This public domain name registrant database, known as the �WHOIS� database, serves many important public policy goals and is widely used by intellectual property rights holders, law enforcement, network operators, and consumers." Steven Metalitz, Counsel for the Copyright Coalition on Domain Names, stated in his prepared testimony that "Access to accurate and reliable Whois data is not only important for enforcing intellectual property rights, but is also vital for consumer protection; law enforcement investigations of online crimes; and network security. The recent epidemic of �phishing� or corporate identity theft involves all these concerns, and accurate Whois data could play a critical role in preventing or investigating such frauds." He also said that "The Whois database remains riddled with inaccurate data". While the invited witnesses focused on the problems associated with inaccurate Whois data, Alan Davidson of the Center for Democracy and Technology (CDT), wrote a letter [PDF] to the Subcommittee in which he argued that there are privacy risks associated with accurate data. He stated that "we write to urge the Subcommittee to consider the real privacy questions raised for people who register domain names and must put sensitive personal information in the publicly available Whois database. There are valuable technical, consumer protection and enforcement benefits from Whois, but CDT believes a balanced approach can be achieved that preserves enforcement while protecting personal privacy." Davidson continued that "In an era of concern about identity theft and online security, it is unwise to require millions of individual registrants to place their home phone numbers, home addresses, and personal email accounts into a publicly available database that places no restrictions on the use of that data." He concluded that "The best way to achieve accuracy in the Whois database will be to guarantee registrants privacy and security for their information." 9/4. The Senate approved the nomination of Steven Colloton to be a Judge of the U.S. Court of Appeals (8thCir) by a vote of 94-1. See, Roll Call No. 327. 9/4. Miquel Estrada, President Bush's nominee to be a Judge of the U.S. Court of Appeals (DCCir), withdrew his name from consideration. He was first nominated in May of 2001, but Senate Democrats have delayed and then filibustered his nomination. The full Senate never voted on his nomination. President Bush released a statement: "Mr. Estrada received disgraceful treatment at the hands of 45 United States Senators during the more than two years his nomination was pending. Despite his superb qualifications and the wide bipartisan support for his nomination, these Democrat Senators repeatedly blocked an up-or-down vote that would have led to Mr. Estrada's confirmation. The treatment of this fine man is an unfortunate chapter in the Senate's history." Sen. Orrin Hatch (R-UT), the Chairman of the Senate Judiciary Committee, also released a statement, in which he said that "The Senate ought to be ashamed of its unfair treatment of Miguel Estrada. It repeatedly denied him the dignity of an up or down vote on his nomination." See also, statement by Sen. Patrick Leahy (D-VT), who opposed the nomination: "This nomination is another casualty of the White House�s insistence on dividing instead of uniting the American people over the President�s decisions for the federal courts". See also, and People for the American Way release. 9:00 AM. The House will meet for legislative business. It will continue its consideration of HR 2989, the Transportation, Treasury, and Independent Agencies Appropriations Act, 2004. See, Republican Whip Notice. 1:00 PM. The Electronic Privacy Information Center (EPIC) and Privacy International will host a news conference to release their sixth annual Privacy and Human Rights. The report reviews the state of privacy in over fifty-five countries. The topics to be addressed include Total Information Awareness, CAPPS II, biometric identification, and new technologies of surveillance. The event will be webcast. Location: First Amendment Lounge, National Press Club, 529 14th St. NW, 13th Floor. 9:30 AM. The U.S. Court of Appeals (DCCir) will hear oral argument in Consumer Federation of America v. FCC, No. 02-1337. Judges Edwards, Randolph and Garland will preside. Location: 333 Constitution Ave. NW. 10:00 AM. The Supreme Court will hear oral argument in McConnell v. FEC, a constitutional challenge to the McCain Feingold campaign finance act. See, June 5, 2003 Order List [4 pages in PDF] at pages 3-4. Deadline to submit reply comments to the Federal Communications Commision (FCC) in response to its notice of proposed rulemaking (NPRM) [7 pages in PDF] regarding the draft Nationwide Agreement [28 pages in PDF] of the FCC, the Advisory Council on Historic Preservation, and the National Conference of State Historic Preservation Officers, regarding undertakings for communications facilities, including communications towers and antennas, under the National Historic Preservation Act (NHPA). This proceeding is titled "In the matter of Nationwide Programmatic Agreement Regarding the Section 106 National Historic Preservation Act Review Process". It is WT Docket No. 03-128. For more information, contact Frank Stilwell at 202 418-1892 or fstilwel@fcc.gov. See, story titled "FCC Announces NPRM Regarding Communications Facilities and the National Historic Preservation Act" in TLJ Daily E-Mail Alert No. 677, June 10, 2003. See also, notice in the Federal Register, July 9, 2003, Vol. 68, No. 131, at Pages 40876 - 40887. 9:00 AM - 3:00 PM. The Executive Office of the President's (EOP) Office of Science and Technology Policy's (OSTP) President's Council of Advisors on Science and Technology (PCAST) will meet. The agenda includes (1) discussion of the status of the work of its workforce education subcommittee, (2) discussion of the preliminary draft findings of its information technology manufacturing competitiveness subcommittee, and (3) a continuation of its discussion of nanotechnology and its review of the federal National Nanotechnology Initiative. See, notice in the Federal Register, August 27, 2003, Vol. 68, No. 166, at Pages 51577 - 51578. Location: Room 100 of the National Academy of Sciences Building, 500 5th Street, NW. 11:00 AM. The Cato Institute will host a panel discussion titled "Will Internet Telephony Bring about a Revolution in Telecom Policy?". The speakers will be Scott Marcus (Senior Advisor for Internet Technology at the FCC), Brad Ramsay (National Association of Regulatory Utility Commissioners), Link Hoewing (Verizon), Marilyn Cade (AT&T), and Jeff Pulver (Pulver.com). See, notice. Lunch will follow the program. Location: Cato, 1000 Massachusetts Ave., NW. 1:00 PM. The House Commerce Committee's Subcommittee on Trade and Consumer Protection will hold a hearing on HR 2221, the "Fairness to Contact Lens Consumers Act", sponsored by Rep. Richard Burr (R-NC), Rep. Billy Tauzin (R-LA), Rep. James Sensenbrenner (R-WI), and Rep. Jim Matheson (D-UT). See, notice. It does not reference the internet or electronic commerce. However, if passed, it would remove some barriers to the sale of replacement contact lenses over the internet. See, story titled "Bill Would Facilitate Internet Sale of Replacement Contact Lenses" in TLJ Daily E-Mail Alert No. 669, May 29, 2003. Location: Room 2123, Rayburn Building. 4:00 - 5:30 PM. The Brookings Institution will host a panel discussion titled "A Preview of the World Bank/IMF and World Trade Organization Meetings". See, notice. Location: Falk Auditorium, Brookings, 1775 Massachusetts Ave., NW. 9:30 AM. The Federal Communications Commission (FCC) will hold a meeting. See, agenda [3 pages in PDF]. Location: FCC, 445 12th Street, SW, Room TW-C05 (Commission Meeting Room). 10:00 AM. The Internal Revenue Service (IRS) will hold a hearing on proposed regulations relating to the definition of toll telephone service for purposes of the communications excise tax. See, notice in the Federal Register, June 17, 2003, Vol. 68, No. 116, at Pages 35828 - 35829. Location: Room 4718, Internal Revenue Building, 1111 Constitution Avenue, NW. 10:30 AM - 12:00 NOON. The U.S. International Telecommunication Advisory Committee (ITAC) will meet to discuss the matters related to the International Telecommunications Union's (ITU) World Summit on the Information Society (WSIS), which will take place on December 10-12, 2003, in Geneva, Switzerland. See, notice in the Federal Register, August 18, 2003, Vol. 68, No. 159, at Pages 49536 - 49537. Location: Historic National Academy of Science Building, 2100 C St., NW. 12:00 NOON. Deadline to submit written comments to the U.S. Trade Representative's (USTR) interagency Trade Policy Staff Committee (TPSC) to assist it in preparing its annual report to the Congress on the People's Republic of China's compliance with the commitments that it made in connection with its accession to the World Trade Organization (WTO). See, notice in the Federal Register, July 21, 2003, Vol. 68, No. 139, at Pages 43247 - 43248. 4:00 PM. Josef Drexl (Max Planck Institute for Intellectual Property, Competition, and Tax Law) will give a lecture titled "The Role of International Private Law in Establishing a Competition-Oriented International Copyright System". For more information, contact Robert Brauneis at 202 994-6138 or rbrauneis@law.gwu.edu. Location: George Washington University Law School, Faculty Conference Center, 5th Floor, Burns Building, 716 20th Street, NW. 9:00 AM - 4:30 PM. The U.S. Patent and Trademark Office (USPTO) will host of meeting of its Nanotechnology Customer Partnership initiative. RSVP to Jill Warden at 703 308-4037 or Jill.Warden@uspto.gov. See, notice. Location: Patent Theater, Crystal Park 2, 2nd Floor, 2121 Crystal Drive, Arlington, VA.
9:30 AM. The House Commerce Committee's Subcommittee on Telecommunications and the Internet will hold a hearing on HR 2898, the "E-911 Implementation Act of 2003". See, notice. The event will be webcast. Location: Room 2322, Rayburn Building. Deadline to submit comments to the Federal Communications Commission's (FCC) Notice of Inquiry (NOI) that solicits "data and information on the status of competition in the market for the delivery of video programming for our tenth annual report". Deadline for claimants to royalty fees collected for calendar year 2001 under the cable statutory license to submit comments and notices of intention to participate to the Copyright Office regarding whether a Phase I or Phase II controversy exists as to the distribution of those fees. See, notice in the Federal Register, August 13, 2003, Vol. 68, No. 156, at Pages 48415 - 48417. The U.S. Patent and Trademark Office's (USPTO) final rule amending its rules to separate the provisions for patent matters and trademark matters with respect to filing correspondence, requesting copies of documents, payment of fees, and general information takes effect. The USPTO is "amending its Rules of Practice in Patent Cases to delete all references to trademark matters, and amending its Rules of Practice in Trademark Cases to add new rules setting forth provisions for corresponding with and paying fees to the Office in trademark cases, and for requesting copies of trademark documents." See, notice in the Federal Register, August 13, 2003, Vol. 68, No. 156, at Pages 48286 - 48293. Deadline for Members of Congress to sign a letter to Federal Communications Commission (FCC) Chairman Michael Powell regarding network neutrality. The letter is being circulated by Rep. Rick Boucher (D-VA) and Rep. Ron Kind (D-WI). 9/4. The Electronic Privacy Information Center (EPIC) filed a complaint in U.S. District Court (DC) against the Transportation Security Administration (TSA) under the Freedom of Information Act (FOIA), codified at 5 U.S.C. � 552, seeking the expedited processing and release of agency records concerning the Computer Assisted Passenger Prescreening System (CAPPS II). The EPIC also filed a motion for a temporary restraining order seeking the immediate release release of two documents. See, the EPIC's Memorandum in Support of Plaintiff's Motion for Temporary Restraining Order and Preliminary Injunction [16 pages in PDF]. Before the terrorist attacks of September 11, 2001, the airlines conducted passenger screening, and administered the CAPPS I, subject to federal guidelines. In late 2001, the Congress passed the Aviation and Transportation Security Act, which created the TSA as a unit of the Department of Transportation (DOT). This Act gave the TSA responsibility for airport passenger screening. In late 2002, the Congress passed the Homeland Security Act, which, among other things, created the Department of Homeland Security (DHS), and transferred the TSA from the DOT to the new DHS. The new CAPPS II, the next generation passenger screening system, will be a government (TSA) run system that replaces CAPPS I. The EPIC, and others, have privacy related concerns about the CAPPS II. The TSA published a Privacy Act notice and request for comments in the Federal Register on January 15, 2003 in which it proposed to establish a new system of records to support the development of the new version of the CAPPS. See, Federal Register, January 15, 2003, January 15, 2003, Vol. 68, No. 10, at Pages 2101 - 2103. The TSA published a second Privacy Act notice and request for comments in the Federal Register on August 1, 2003, in which it announced that it received "substantial comments ... in response to the prior notice", and that "significant changes have been made to date to the proposed CAPPS II system and to the CAPPS II Privacy Act notice in light of these comments". This second notice further states that "Additional comments are sought on the modifications to this Privacy Act notice". This second notice sets a September 30, 2003 deadline for public comments. See, Federal Register, August 1, 2003, Vol. 68, No. 148, at Pages 45265 - 45269. The two items requested by the EPIC in its FOIA request that are the subject of this TRO motion are (1) "any ``Capital Asset Plan and Business Case�� materials (Exhibit 300) submitted to the Office of Management and Budget", and (2) "any ``Privacy Impact Assessments�� prepared for the CAPPS II project". The EPIC asserts that it is urgent that these records be produced on an expedited basis because they contain relevant information about the CAPPS II system, and because persons who submit comments to the TSA in response to its second Privacy Act notice would benefit from having access these records before the September 30, 2003 deadline for public comments. The EPIC memorandum was written by EPIC General Counsel David Sobel (at right). He argues that "any further delay in the processing of plaintiff�s FOIA request will irreparably harm plaintiff�s ability (and that of the public) to engage in informed discussion and debate on the privacy and constitutional implications of TSA's controversial CAPPS II program." He concludes that "Without the expedited access to information about the CAPPS II program to which it is legally entitled, plaintiff's ability to engage in an urgent and current public policy debate will be irretrievably lost." TSA Explanation of CAPPS II. The second Privacy Act notice, published on August 1, provides information about the new CAPPS II. It states that the "TSA will obtain electronically, either from airlines or from Global Distribution Systems, a passenger's ``passenger name record�� (PNR) as collected from the passenger by a reservation system. PNR includes the routine information collected at the time a passenger makes a flight reservation. A PNR may include each passenger's full name, home address, home telephone number, and date of birth, as well as some information about that passenger's itinerary. No additional information beyond this data is required to be collected from passengers for the operation of CAPPS II." The notice continues that the "CAPPS II system will access PNRs prior to the departure of the passenger's flight. Selected information will be securely transmitted to commercial data providers, for the sole purpose of authenticating passenger identity. This authentication will be accomplished not by a permanent co-mingling of data, but merely by the commercial data providers transmitting back to TSA a numeric score, which is an indication of the percentage of accuracy of the match between the commercial data and the data held by TSA. This will enable TSA to have a reasonable degree of confidence that each passenger is who he or she claims to be. TSA recognizes that inaccuracies in the commercial data may exist and that the CAPPS II system must allow for and compensate for such inaccuracies; this test phase is intended to test and further develop such capabilities in the system." The TSA's notice also states that "Commercial data providers will receive a limited amount of identifying information from TSA with regard to each passenger, and will provide TSA with an authentication score and code indicating a confidence level in that passenger's identity. The commercial data providers will not provide TSA with any additional information about the individual. They will not acquire ownership of the data, nor will they be permitted to retain the data in any commercially usable form. TSA will not permit the commercial data providers to use this data for any purpose other than in connection with the CAPPS II program. Importantly, the commercial data provider will not retain information about the response they provide to TSA in any record about the individual that they maintain. Further, no persistent link between an individual's records in the private sector and that person's records within the CAPPS II system will be created." The TSA elaborates that "Once CAPPS II has authenticated a passenger's identity, it will conduct its risk assessment. The risk assessment function is conducted internally within the U.S. government and will determine the likelihood that a passenger is a known terrorist, or has identifiable links to known terrorists or terrorist organizations. National security information from within the Federal Government, as well as information reflecting Federal officials with high levels of security clearance, will be part of this analysis function." And, the TSA notice states that "After the CAPPS II system becomes operational, it is contemplated that information regarding persons with outstanding state or Federal arrest warrants for crimes of violence may also be analyzed and applied in the context of this system." On August 25, 2003, the DHS's Chief Privacy Officer, Nuala Kelly (at right), and the TSA Administrator, Admiral James Loy, issued a joint statement regarding the CAPPS II. They stated that "CAPPS II will use limited passenger information to make flying more secure without impinging on individual privacy rights." Opposition to CAPPS II. Also on August 25, the American Civil Liberties Union (ACLU) and other groups held a forum in Washington at which the CAPPS II was criticized. The ACLU released a report that lists a number of objections to CAPPS II. First, the ACLU states that "The biggest problem with CAPPS II is that, simply put, we have no idea what it will do." Third, the report asserts that CAPPS II will be subject to "mission creep". If it is built, it will first be used to detect terrorists, but may soon also be expanded to categories ranging from drug dealers to deadbeat dads. Fourth, the ACLU report states that CAPPS II provides no due process. There is no notice, and no appeal. It states that the "Kafkaesque potential of this system has been starkly demonstrated by the government�s existing �no-fly� lists, under which many innocent, law abiding Americans have found themselves subject to relentless hassles, interrogation and searches every time they try to travel by air -- and have been unable to clear their names in the federal bureaucracy." Finally, the report suggests that there is a potential discriminatory impact. That is, "there is a very real possibility that it will treat Americans unequally based on characteristics such as race, religion, and ethnic origin." See also, the EPIC's web page titled Air Travel Privacy.